Charlie Mahtesian from Politico did a great job summarizing the counties that will decide the presidential race. He listed 16 counties and I think people should read the piece. I am watching more counties and I will divide them by state. In 2012, Obama won Florida by the smallest of margin 50% to 49%. In 2008, his margin of victory was a bit bigger 51% to 48%. Obama won Pennsylvania in 2008 and 2012 by wide margins – 55% to 44% in 2008 and 52% to 47% in 2012. Romney lost New Hampshire to Obama in 2012 52% to 46%, while McCain lost it by 9%. Obama won in 2008 54% to 45%. Obama won the state 57% to 41% in 2008 and in 2012 he beat Romney 54% to 45%. When I started this blog at the beginning of the primaries, I was hoping that I could comment on this year’s election cycle on a regular basis. And I did a pretty good job up to April. By April, I had to start dedicating my energies to other projects. I did follow the elections very closely, but I could not find the time to write my reactions to the race’s many twists and turns. I plan today to write a few blog posts. This one is on the presidential race. The next one will look at some of the counties that I will be following as the results of the election start coming in. Who will the presidential election? 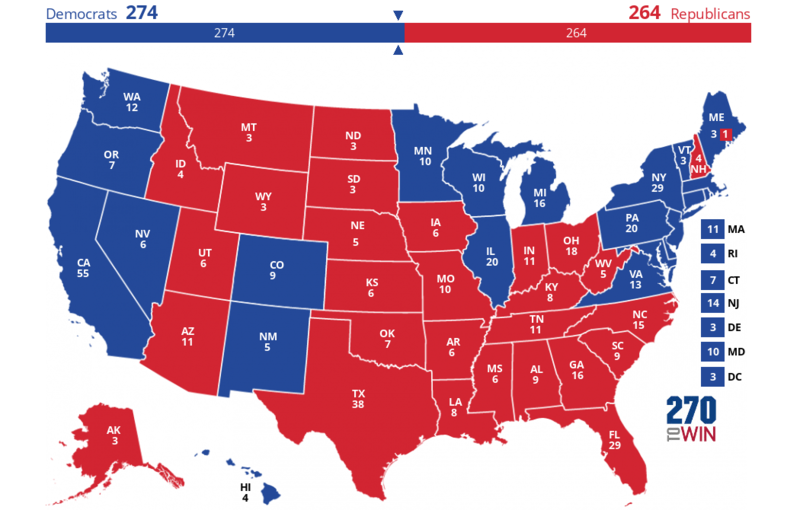 In 2012, we had a competition among the political science faculty at Drew University to see who could accurately predict the outcome of the presidential election. I won the competition, which was a bit surprising. I got all the states right minus North Carolina, which Mitt Romney won. While I was following Nate Silver’s model very closely, I was also a fan of Sam Wang’s Princeton Election Consortium’s (PEC) forecast. This year I designed a similar competition but we invited our students and Drew alumni to join the game. More than 85 people completed the survey. Will I be able to defend my 2012 title? We will know in a few hours…. I have to admit I played a lot with the map before I made my final selections. I looked closely at PEC’s forecast, at FiveThirtyEight’s model – created by Nate Silver, and the Real Clear Politics’ poll of polling averages. I also read closely some polls from the battleground states. There is a pretty good chance that Hillary Clinton will win more states. I think her ceiling is around 322, which is in line with Larry Sabato’s prediction. But, polling data (and my gut) says that it will be closer a race. Let me explain, the logic of my argument. I believe that Donald Trump will win all the states Romney won in 2012, which includes North Carolina, and he will flip Ohio, Iowa, Florida and Maine’s 2nd Congressional District. Indeed, Trump cannot win the presidency without NC, FL, and OH. Let me explain why I think he will win these three states, though the polls show that Clinton seems to be gaining strength at the national level and many of the battleground states. First, the Clinton campaign has been concerned by signs that the African American vote will not be as high as in 2012. It is important to note that turnout among African Americans remained the same – around 13% of the electorate – in 2008 and 2012. But African Americans slightly favored Romney over McCain. The early vote data in NC does show that the African American vote has declined by at least 8%. In contrast, there has been an increase of White voters and independent voters, which have largely favored Trump. This could change with same day voting but the initial numbers are not very encouraging for Democrats. In FL, the African American vote has not declined, but polls show that Trump’s numbers may be better than Romney’s performance. Romney received only 4% of the African American vote, while Obama received 95% – according to exit polls. According to the most recent CBS/YouGov poll, Trump will get 6% of the African American vote and Clinton will receive 91%. The declines in these figures for Democrats are not that big, but in a tight race these margins matter. We will see how things shape in OH, but the polls have mostly favored Trump and OH is less diverse when compared to NC and FL. Second, I am not sure whether Millennials will vote at 2012 levels. Millennials now represent the biggest voting group in the US after Baby Boomers. It is also the most diverse cohort. While these voters tend to vote Democratic, the question is whether they will show up. In 2012, this cohort represented 19% of the electorate. Romney won 37% of the Millennial vote. National polls show that Trump will get around 25% of this vote. This should be good news for Clinton. But, while Obama earned 60% of the Millennial vote in 2012, Clinton is currently polling around 55%. The rest of Millennials are expected to support third party candidates. In FL, Obama won 68% of the Millennial vote, while Romney won 32%. The CBS/YouGov poll of FL suggests that the Millennial vote will be split along the following lines: 44% for Clinton, 28% for Trump, 14% for Gary Johnson and 6% for Jill Stein. If these numbers are accurate, then it will be a long night for Clinton. Third, while I am glad to see a surge among Latino/a voters, I am not sure if this will affect Trump as much as we think. Let’s look at FL again because it has a large Latino/a population. In 2012, Hispanics favored Obama over Romney 60% to 39%. The most recent CBS/YouGov finds that Clinton will get 54% of the vote, while Trump will receive 34%. Surprisingly, 3% will vote for Stein and 1% for Johnson. These figures suggest that Clinton will underperform Obama’s numbers by 6%, while Trump’s numbers will be 5% points lower. Hispanic voters are quite diverse and it is important to not generalize that vote. Cubans, Puerto Ricans, Mexicans, Central Americans, and South Americans have different voting preferences. Thus, I think it is important not to assume that because Latinos/as in Nevada are strongly voting against Trump, that the same will happen in FL, NC or other states. These three observations explain why I think that Trump may win FL and NC. But how about IA, NH, and Maine’s 2nd Congressional District? I think that these observations apply but these states are less diverse. On OH and IA, Trump has been leading most state polls. In the last week, polls in NH and in Maine’s 2nd Congressional District have tightened. In the end, I think that his populist message and his views on free trade resonate with many voters. I was tempted to give Trump Michigan. And I think that Trump could flip this state. In the last week, the polls in Michigan show that Republicans are starting to move Trump’s way. If we assume that the African American vote will not be as strong this year, then this could help Trump win the state. The same logic applies to Pennsylvania. If blue collars workers vote for Trump in big numbers and the Democrats have difficulty turning out the African American vote and the urban vote in Philadelphia, Trump could really make this an interesting race. To conclude, Clinton wins but I think it will by a tight margin. Boston’s Old State House photographed from the intersection of Court Street and Court Square early in the morning. Who Won the 9th Democratic Debate in Brooklyn? The Brooklyn Democratic debate was actually pretty entertaining. It is clear that there is little love between the candidates. Bernie Sanders came into the debate winning the last seven nomination contests. Although Hillary Clinton’s lead is insurmountable, she wants to change the narrative. The last thing she wants is for Sanders to keep winning primaries and raise questions about her candidacy. The debate was both entertaining and informative. Did the candidates’ performance change the dynamics of the race? No. Both Sanders and Clinton had very good moments and some bad ones. I do research on foreign policy. Thus, I do have a bias to foreign policy issues. I think that the exchange on Israel was quite revealing. Hillary Clinton double-downed on her strong support for Benjamin Netanyahu, often explaining why Israel’s use of disproportionate attacks against Palestinian is necessary. She blamed Yasser Arafat for not supporting her husband’s Camp David II peace plan and placed blame on Palestinians for the failure of the peace process. And, she stressed her role in negotiating a cease-fire in Gaza a few years ago. Clinton’s positions are not new and they will not necessarily hurt her in the upcoming New York primary or the general election. But, her stance could complicate the search for an Israeli-Palestinian peace if she wins the presidency. Also, her decision to blame Palestinians for the situation also raises questions about her progressive values. As a Jewish candidate, with personal connections to Israel, Sanders emphasized that Israeli actions in Gaza, and the West Bank, has gone too far. While he recognizes Israel’s right to self-defense, he also notes that Israeli attacks have been disproportionate. He stressed Palestinians’ angst and worsening living conditions, while promising that a Sanders’ presidency would be even-handed. Sanders was extremely critical of Netanyahu and his coalition government. It is obvious that Sanders’ views are in line with Israeli left’s understandings of the conflict. Even though Sanders knows that this position will not play well in New York City’s Jewish community, he still defended his opinion on this very controversial issue – a very courageous act! Thanks to Donald Trump’s recent criticisms of NATO, Sanders and Clinton were asked to explain their views on NATO. Like Trump, Sanders believes that NATO members need to spend a little bit more on defense. Clinton, though agreeing with Sanders on this point, stressed the importance of NATO in America’s global security strategy. And she is right on this point. But, the foreign policy discussion, which also included heated exchanges on Libya and Syria, demonstrated that she is a liberal internationalist who believes that military power can be used to promote American values and interests. Clinton’s attacks on Sanders’ record on gun control was very effective, but Sanders scored some big points on Clinton’s paid speeches at Goldman Sachs and her shifting positions on raising the minimum wage to $15 per hour. I think Sanders won the debate, but by a very small margin. Will it make a difference as New Yorkers go to the polls next Tuesday? It is difficult to say. I think that Clinton will win the primary, but not by a big margin. Princeton University’s Julian Zelizer gave Clinton the win. Chris Cillizza from the Washington Post’s The Fix also gave the win to Clinton. David Graham from The Atlantic argues that Sanders won the debate, though he also notes that he was unable to change the dynamics of the race. And the completely unscientific online polls give the win to Sanders. Who won Thursday’s Democratic debate? Two Democratic presidential candidates took to the stage for a debate Wednesday night in Brooklyn. Who do you think won? Who won the latest debate? I have said it before: I love looking at these online polls. Even though they are very, very unscientific, they allow us to gauge voter enthusiasm. Long exposure, night photograph of Magic Kingdom’s Dumbo ride. Long exposure photograph of the Magic Kingdom’s Mad Tea Party at night – Walt Disney World, Florida, USA. Night photography of EPCOT’s Imagination Pavilion. On 19 March 2016, The Daily Record published one of my opinion essays. Here is a link to the essay. I am pasting and copying the piece below because there is a paywall. With her recent primary victories, Hillary Clinton will secure the Democratic Party’s presidential nomination in the next few weeks. Although Clinton is starting to pivot towards the general election, it should not ignore Bernie Sanders’ insurgent campaign yet. Despite her many victories, a closer look at the results raises four questions regarding her campaign’s readiness to compete in the general election. The first problem is her message. If we look at the dynamics of both the Democratic and Republican nomination contests, there is a tension between the political establishment and anti-establishment voters. This tension is more pronounced in the Republican Party right now, but it is also influencing the Democratic race. Many voters are dissatisfied and angry at the status quo and they are thirsty for change. For most of January and February, Clinton dismissed Sanders’ ideas and vision of the future as unrealistic. Looking toward the Southern primaries, she defended her husband’s record and promised to expand President Barack Obama’s legacy. By early March, Clinton has adopted many of Sanders’ ideas. While this make sense from a political perspective, it has muddled her message. That creates a second challenge for the Clinton campaign. Voter enthusiasm is higher in the Republican caucuses and primaries than in the Democratic ones. Only five Democratic contests have established new records for voter turnout — Minnesota, Colorado, Kansas, Nebraska and Maine — and Sanders has won all these caucuses by wide margins. And while Clinton has won far more contests, her candidacy is not attracting or winning new voters. A third challenge has been Clinton’s mixed performance in the swing states that have already held their caucuses or primaries. For the general election she will need to mobilize Democrats and secure a majority of the independent vote in these states. While Clinton has won many of these swing states, Sanders has outperformed her with this critical voting bloc. It seems Clinton’s biggest challenge is to convince Sanders’ core supporters to back her presidential campaign, especially young voters and the so-called angry voters. It won’t be easy. Many of Sanders’ voters do not trust Clinton. While young voters, who are between the ages of 18 and 29, helped Barack Obama win the presidency in 2008 and his re-election in 2012, their attitudes towards the president and the economy have soured in the last few years. A recent survey from Harvard University’s Institute for Politics found that a majority of young voters value candidates who have a high level of integrity, are levelheaded and are authentic. Less than 20 percent of young voters, according to the survey favored political experience as an important attribute. Does this mean that young people will vote for the Republican nominee? It is unlikely. However, the risk for the Clinton campaign is that they will choose not to vote in November. Clinton may still win the general election with a smaller number of young voters, but in a competitive race it could actually affect her ability to win the swing states. This election cycle has been dominated by the rise of the angry voter, and angry voters tend to favor anti-establishment candidates. We know from exit poll data collected in Republican caucuses and primaries that Donald Trump, and to a lesser extent Ted Cruz, have captured a large percentage of this vote. Many analysts have argued that these angry voters have been fueling Sanders’ candidacy. Data from the Michigan Democratic primary exit poll not only confirms this perspective, but it also finds voters who are satisfied with the status quo strongly support Clinton over Sanders. If the Clinton campaign fails to take into consideration these voters’ interests, many of them will have no problem voting for Trump in a general election. While Clinton may be able to win the election without these voters, her campaign will need to make sure they can replicate President Obama’s 2012 performance. Carlos L. Yordan – Associate Professor of Political Science and International Relations at Drew University. I just recently published a new article on Donald Trump’s political ascendancy in E-International Relations, an online publication. I analyze the results from Iowa, New Hampshire, South Carolina and Nevada to explain Trump’s growing popularity among conservative voters. In a nutshell, I argue that Trump, unlike his rivals, has build a broad-based coalition, exploited voters’ insecurities and channeled voters’ anger with Washington and the Republican establishment. In the article, I note that the Paris attacks and the shootings in San Bernardino propelled Trump’s candidacy. Today, attacks in Brussels will only strengthen Trump’s resolve, while voters who fear the rise of Islamist-inspired violence will more than likely support his presidential hopes. Check out the article! Click here.